ESPN Radio will be carrying the MLB Playoffs from the first pitch of the Wild Card to the final out of the World Series and you can hear it all online at ESPNRadio.com. Live audio streaming will also be available through the MLB At Bat ‘11 App. If you don’t already have the app, you can buy it now at a reduced price. The ESPN Radio app brings you the MLB Playoffs along with all the other ESPN content and even ESPN podcasts. The TuneIn Radio is free and carries loads of Sports Talk Radio stations (along with other radio stations) including ESPN Radio. 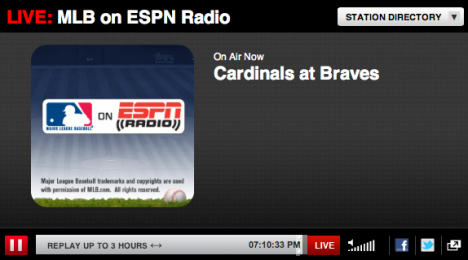 Browse or search to find an ESPN Raio station. ESPN – Bristol is the main network station.